We loved all the excitement we received around Bowerman’s Blueberry Donut, and are thrilled to announce we’ve partnered with Sweetie-licious Bakery, a multi-time National Pie Championship winner with locations in Dewitt and Grand Rapids, to create the second delicious flavor in our Michigan Artisan Collection: Sweetie-licious Pie Surprise! To create this flavor, we combined our chocolate ice cream with bursts of filling from Sweetie-licious’ popular Cherry, Blueberry, Raspberry – or Cherry Berry Berry – pie, and added a special mystery ingredient used in one of our regular all-season flavors. It was incredibly fun to make and we think it’s just as fun to eat! Our team was immediately impressed with the commitment to quality we found from Sweetie-licious Bakery. 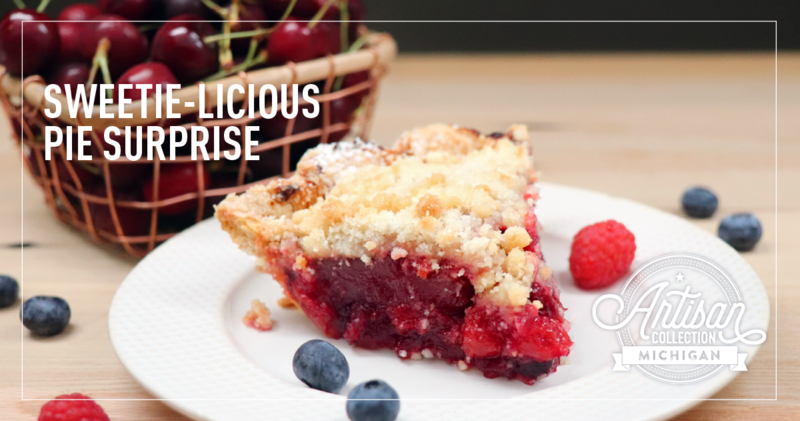 The Cherry Berry Berry pie was one of the very first pies the bakery entered into the National Pie Championships and is based on old family recipes that use Michigan cherries and berries. Sweetie-licious Bakery owner Linda Hundt earned her first National Pie Championships title in 2007. Today, Hundt and the bakery have won 19 awards through the American Pie Council and continue to develop creative, seasonal recipes for their customers. Excited to try Sweetie-licious Pie Surprise? Visit us at the DeWitt Ox Roast on Saturday, August 18, 2018 from 5 – 8 PM, where we will be serving free sample scoops at the Sweetie-licious Bakery location – 108 North Bridge Street, DeWitt, 48820. This small batch flavor will also be available in limited quantities at the following scoop shops starting on Friday, August 17. We hope you have a chance to try this award-worthy flavor before it’s gone. Don’t delay, this flavor won’t last long!